Tomorrow - get tickets at the Summerland Sunday Market - for our event! If you don't have your tickets to the September 14th Penticton event; 'Is Medical Cannabis Right for You? ', see Elaine Nuessler at the Summerland Sunday Market, tomorrow, September 11. Elaine will be selling tickets at the market at the Kyla’s Quest table. The September 14, Penticton event promises to be an eye opener into the newly re-discovered world of hemp and medical cannabis as a major relief from serious illnesses. If you or someone you know suffers from anything from arthritis to epilepsy, you need to come to hear our speakers. See you tomorrow at the last Summerland market for the year! Here is the big news we've been waiting for from Health Canada! A very special thanks to Barry Pogson. The only other advice I would give is to be patient, they will need to assess everyone on a case by case basis. This is such a good start and we are grateful that things are moving in the right direction. Association columnist of the year. Dave Hepburn is the author of "The Doctor Is In(sane)" which was nominated for several book awards. Cohost of the popular national radio program "Wisequacks" heard weekly across Canada. edge of a volcano as it exploded were chronicled weekly on CBC radio. (nuclear, biological, chemical warfare) medical treatment. rugby team as well as junior and professional hockey teams. Director of Medical Relations on the Board of the David Foster Foundation. the Canadian Boy Scouts for 14 years. Drop by our table tomorrow - Aug 7 - at the Summerland Sunday Market! Tomorrow we will be back at the Summerland Sunday Farmer's Market. Please do come and see us. To those of you who have been wondering.... Kyla has had a bad week but has turned the corner and we are all feeling a sense of relief. It turns out she had the flu! Kyla's Quest is excited to have Dr. Dave Hepburn of Doctors without Boredom (Wisequacks) come to speak in Penticton on Sept 14... watch for tickets to this event on the topic of medical cannabis! (Please note: The date has been changed from Sept 21). Dr. Dave Hepburn is one of two vibrant, funny, fearless and pioneering Canadian doctors who are on a mission to bring back medicines from the outer extremities of the earth. Their goal is to help improve the lives of patients everywhere and they will go anywhere to find the next traditional cure. Their program Wisequacks is the most fun, informative and upbeat health show in the media today! Where to next find us; this coming weekend July 23 from 11:00 - 4:00 at the Okanagan Tattoo Show in Kelowna at the Kelowna Curling Rick. Then on Sunday, July 24 we will have our usual table at the Summerland Farmer’s Market. Stop by and see us! As the Director of Kyla’s Quest I attended the Vancouver conference this month in order to further my knowledge and connect with people in the medical cannabis world. What I discovered at the conference, was that there was a wealth of information from various parts of the world; from doctors, scientists, specialists and many growers and producers in the industry. I had the opportunity to speak about Kyla’s journey, Kyla’s Quest, medical cannabis for sick kids and our struggle with getting clean, consistent, high-quality product namely Charlotte’s Web, for many children in Canada. Of particular interest to me regarding the presenters was our keynote speaker Dr. Lumír Ondrej Hanuš - the scientist who initially identified the endocannabinoid system. 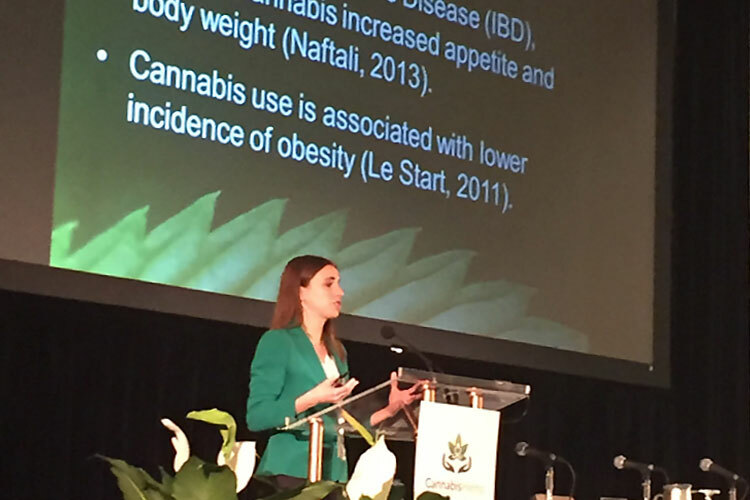 A number of other doctors spoke on various aspects of the use of medical cannabis and Dr. Natasha Ryz was particularly enlightening on the subject of cannabis and the gut. It was a great day at the Summerland Market last weekend! Thank you everyone who stopped by the Kyla's Quest table. There were lots of great questions and information sharing. I will be back at the market on the 17th of July with many new hemp products for purchase. Looking forward to seeing you then! A letter aimed at MP's concerning the seizing of hemp oil shipments coming into Canada. help from the government of Canada to protect the health of our children. our children have already suffered irreversible brain damage because of their seizures. Charlotte’s Web to control our children’s seizures. It is produced in Colorado by CW Hemp. children are being offered a new chance at life. in cannabis, CBD, that doctors believe controls the seizures. Charlotte’s Web is the only product they could recommend for us on children. border, they were suspending all shipments of Charlotte’s Web until further notice. asking for your help to solve this problem. Please can you urgently investigate why a legal product is being seized at the border? that Charlotte’s Web can become a legal product in Canada? the only thing keeping them from brain damage or death? "Some of these parents are hoping pot can help where mainstream medicine has failed.